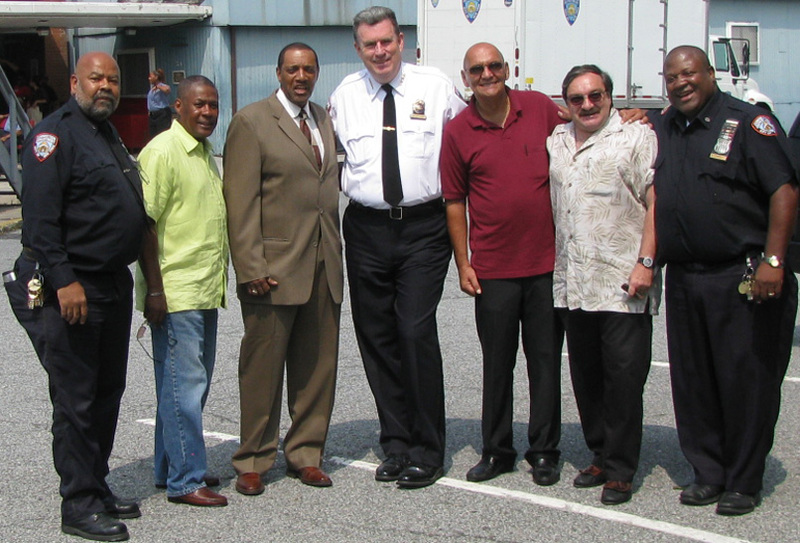 left, and retired Captain William Kolessar, second right, honoring retiree Patrick Coffey (maroon shirt). Click above image to access larger version. Use browser "back" button to return. Image of retiring C.O.J. B. Brown derived from one provided by fellow AMKC C.O. Glenn Ebron. AMKC COs Patrick Coffey & J. B. Brown retire after DOC service totaling 71+ years! 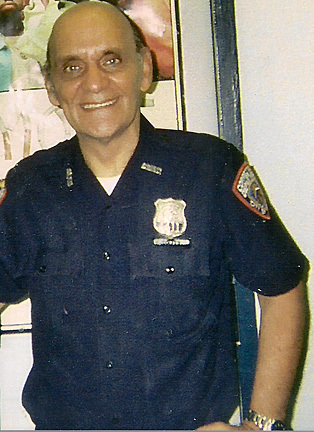 Image of retiring C.O. Patrick Coffey derived from one provided by fellow AMKC C.O. Glenn Ebron. 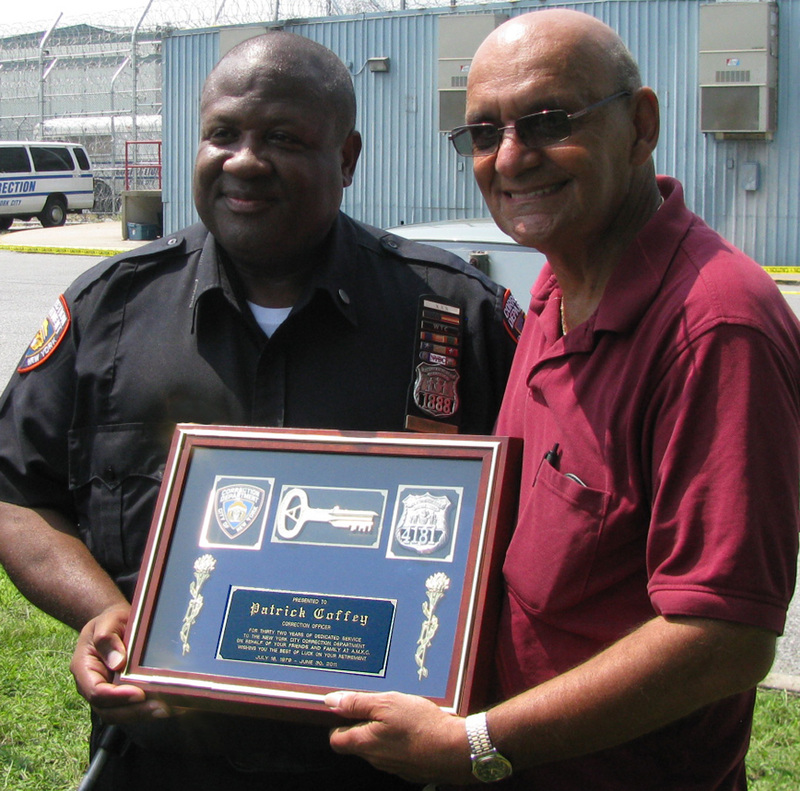 Not everyday do two Correction Officers at the same Rikers Island facility retire after combined NYC DOC service totaling 71+ years! That's what has happened at the Anna M. Kross Center (AMKC) with the retirement of C.O. Patrick Coffey (32 years service) and James B. Brown (39 years service). With C.O. Brown's retirement, seven Tier I eligible DOC staffers -- three uniformed and four civilians -- now remain still on the job. So far the research has not found any "pinned Dinosaur" among them, but the hunt is not yet completed. Former AMKC warden chats with honoree, others at Coffey/Brown fete. .
Chief of Department Michael Hourihane, who started with DOC as a C.O. at JATC in 1981, rose in the ranks to serve as warden of AMKC from 2007 until appointed Deputy Chief in 2010. Clicking image above or below accesses its larger version. Use browser "back" button to return. To mark the occasion and honor the duo's DOC dedication, the "AMKC family" scheduled a front lawn lunch time gathering Friday, August 19th . Unfortunately, a sudden illness prevented Brown attending. The CorrectionHistory.Org web site and its New York Correction History group page on Facebook join in saluting the pair.Their 71+ years service total was brought to our attention by fellow C-95 C.O. Glenn Ebron after he read our web site story about NYC DOC Dinosaurs. The DOC Dinos were a very informal group of veteran officers who, after the state legislature in 1973 created the multi-tiered pension system, realized that, as Tier I category members, they would be the last to have the full benefits package. So they donned dino pins in self-deprecating humor to signify being "the last of their kind." 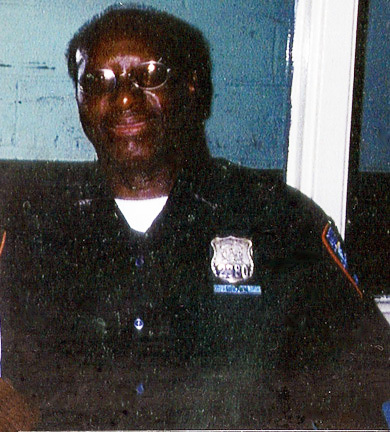 Tier 1 Correction Officer James B. 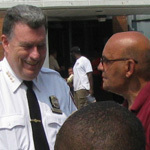 Brown, who has 39 years of service. Talk about dinos. I have been honored to work with him for 30 years. Correction Officer Patrick Coffey, who has 32 years. He was our old union delegate under COBA president Phil Seelig. "As for the dino pins, I know that they did have them. "We are planning a celebration of their service. Above is image of honoree Patrick's plaque derived from photo of CO Ebron and Coffey holding it. Click to access. Use browser "back" button to return. Son, C.O. 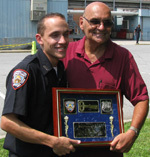 Todd Coffey, poses with father holding plaque that cites Patrick's "32 years of dedicated service" and notes "your friends and family at AMKC wishing you the best . . . on your retirement. " Click to access larger version. Use browser "back" button to return. "When I think of Correction History, I think of a tight-knitted Correction family. One looked forward coming to work because you knew that your Correction family had your back in whatever situation that may arise, from the Warden down through the ranks. "I think of the discipline that was demanded, from our superiors on down through the ranks, not only for ourselves but also in how we conducted ourselves to the inmate population and also how we presented ourselves to the public. 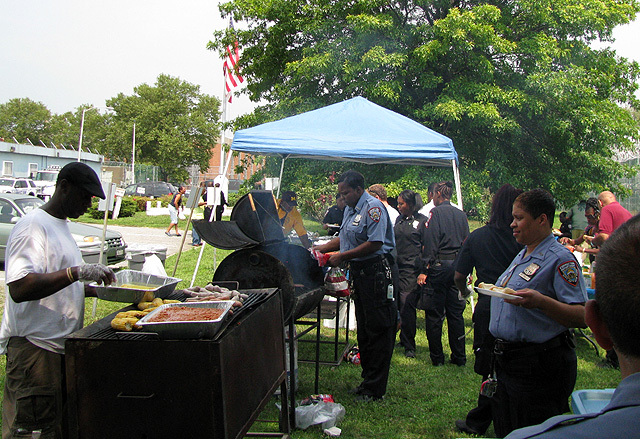 There was also a call for respect, discipline which was applied to the inmate population. Correction Officers like J. B. Brown and Patty Coffey have helped pave the way for so many. "I think of the riot days at HDM, C- 95, North Facility and C-76 . . . . 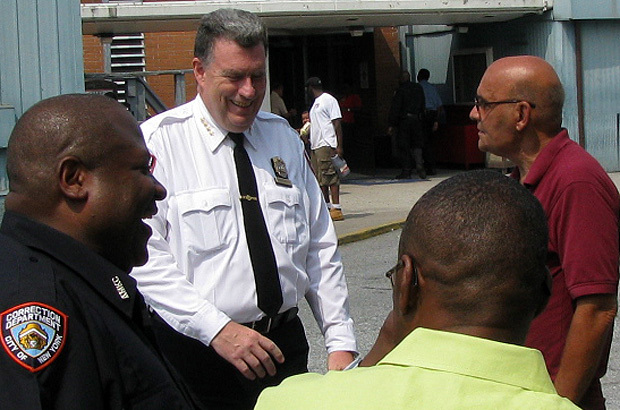 It was Correction Officers like J.B. who, in effect, wrote the institutional policies as we have now, because Correction Officers like him were on the front lines . . . .
"Correction Officer Patty Coffey and others assisted union leadership winning for Correction Officers the 'step off in 20 retirement.' But he didn't 'step off.' 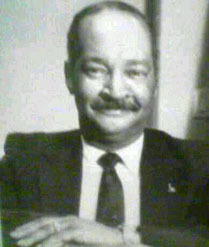 "
Note the dinosaur pin seen in lapel of former Commissioner James W. Hunter in his official photo. 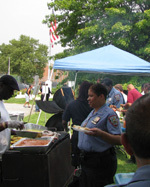 Above is a scene derived from a photo taken at the AMKC Aug. 19, 2011 lunch-time gathering held to mark the retirements of COs Coffey and Brown. Click to access larger version. Use browser "back" button to return. "WOW! Having Patty and JB retire is certainly bittersweet. "While I'm glad for them to enjoy life beyond DOC and so very grateful that I was fortunate enough to have been 'raised' by them, I'm saddened to think that the next generation of officers will only know them as a 'name' and not get the benefit of knowing them personally and professionally. "So many legends have walked the halls of AMKC and have each in their own way left their 'mark' but none more than Patty and JB. "It's difficult to think of AMKC without thinking of them . . . .
"It's up to us who remain in the career we've all embraced to keep their legacy active and do our best to pass on their collective wisdom to those who will take the reins after us. 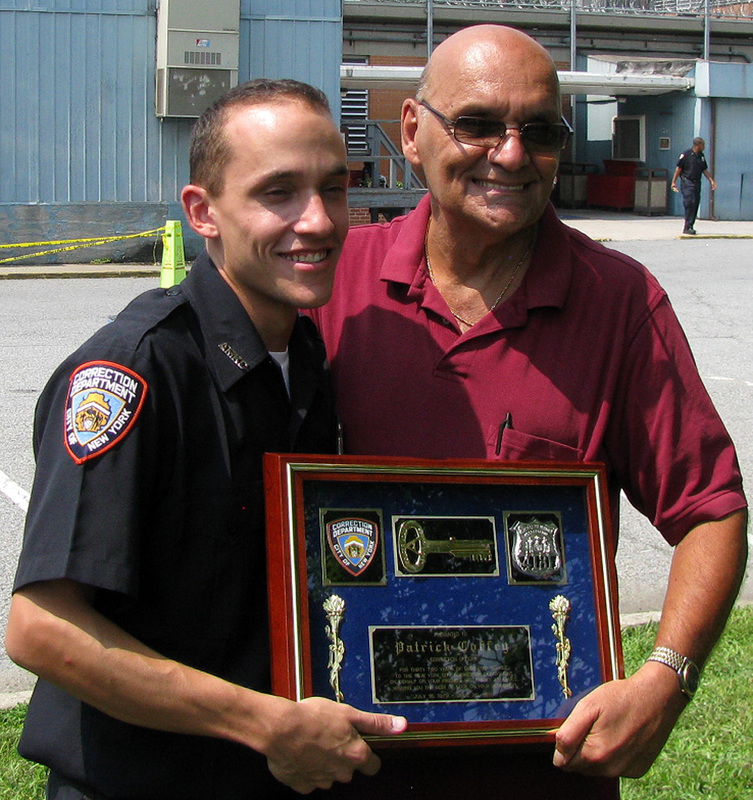 "I know that I'm a better Correction officer and person for having had the privilege of learning from them. Above is an image of then recently appointed Division Chief Marron Hopkins from the Summer 1990 Correction News issue. 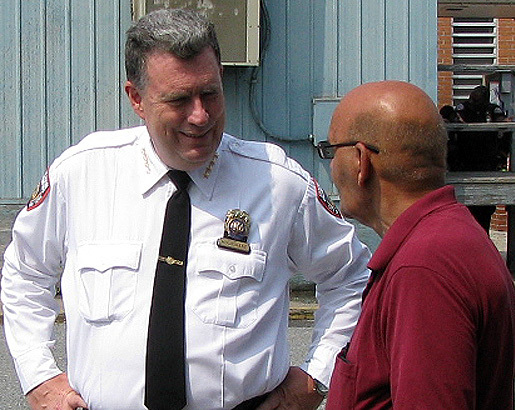 In the spring of 1992, he was named Chief of Department by the Commissioner Catherine M. Abate. 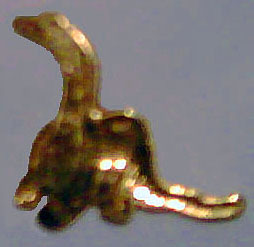 Above is an image of the gold color pin that Marron Hopkins purchased and wore after being named Chief of Department in 1992 by then Commissioner Catherine M. Abate. It replaced the green dino pin he wore previously. "No doubt, there are hundreds, if not thousands of members of service of all ranks who can say the same thing. "No matter where I'm assigned in DOC, I will always consider AMKC my 'home' and those I've had the pleasure to work with while assigned there my brothers and sisters. "I always get a special feeling when I 'come home' to AMKC, although now, home will be a little more empty without two of my brothers, Patty and JB." Given the very loose and informal nature of the NYC DOC Dinosaurs, Tier I members began conferring dino pins on non-Tier I veteran officers after they reached certain plateaus of DOC service such as 25 years. "Someone gave me one after I did 25 years but I can't remember who. . . ."
Do Dinosaurs Still Roam Earth? Here's a pin-point accurate answer!